Price: 100 kronor, children and youths 50 kronor. Reduced rates possible for groups. To reserve tickets call 0702-55 71 25 or 0709-81 51 52. The show is supported by The School of Engineering of Jönköping University. Students from the Lighting design program at Jönköping University will design the lighting. The idea to make a show based on a music album has been on Viktor and Peter's minds for a long time. Initially the idea was quite different from Roxette's "Look Sharp", but this gem from the eighties finally made up the basis for this juggling show! With creative modern juggling, high techincal skill, loud music, and wild hair-styles, these performers provide you with the world premiere of their new show "Look Sharp!" 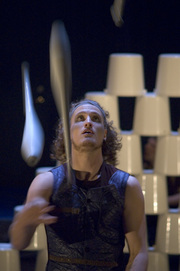 Viktor and Peter attend the Contemporary Circus program in the University College of Dance in Stockholm since the fall '05. Both appear in Visionbot's new juggling flick 9-1 Nordic Objects. 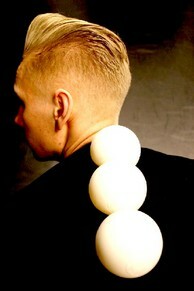 Viktor previously performed in "Juggling Details" and performed an act from that show during last year's Nordic Convention. 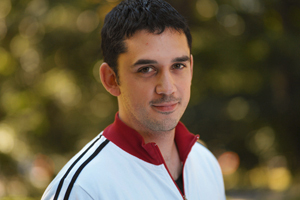 Peter was also among last year's acts, but at the time performing together with Jay Gilligan in the show "Fighting Machines of North Hollywood". When you are in love, everything effects you. Even your juggling can change. 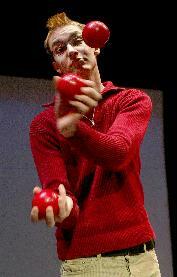 See Pär's emotions turn into nicely flowing juggling routines with funny gags and lovely role playing. Having his dreamgirl in the right hand and the audience in his left Pär blows all borders in usual juggling. Except participating in the Public Show, Pontus is also going to have a large number of workshops during the convention. Pontus is, among other things, the creator and maintainer of www.juggling.se. Ida and Nopa from Cirkus Vana in Malmö have been juggling together for several years. The routine they are going to perform att the convention was created during a year att the Circomedia Circus School. In their act, they have put emphasis on creating a relation between the two caracters, and to give the audience a glimpse into their world. They have performed the piece at many places, including the Brittish Juggling Convention '04, the Scotish Juggling Convention '05, and the Danish Juggling Convention '06. At the moment they are putting together a street show for a summer tour, and enjoy the spring whith their one-year-old daugther. Mattias Jönsson is doing a diabolo act, and Petter Wadsten is doing a Ring routine. There is still room for one or two more acts, so if you want to perform, or if you want to appear in the open stage show during the convention—call Staffan Ulfberg, mobile phone 070-8135969.